Lars Burmeister was born in Hamburg, Germany, on April 26, 1984, is a German male model. 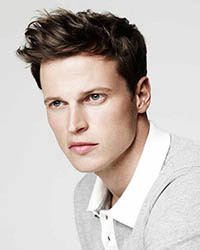 Lars was discovered at the age of 23, by model scout from modeling agency Mega Models in Hamburg. His hobbies are golfing, running, gym and playing soccer. Long time highly ranked on The Money Guys List by models.com. He made his big screen debut in German biographical film The Girl with Nine Wigs (2013) in role as Ole. Vogue Espana, Caleo Cover, ODDA Magazine, Esquire Serbia, DSECTION, GQ Brasil, Visual Tales, GQ Style Germany, Zeit Magazine, Essential Homme, CFDA Journal, Playing Fashion, Slurp Cover, V Man, PEPLVM Magazine. OVS Industry, Joop, Givenchy, Daks, Gant, Corneliani, Giorgio Armani, Fay, French Connection, Mango, Sarar, Hugo Boss, Siviglia, Porsche Design, Thierry Mugler. Walked runway for Joseph Abboud, Versace, Jeffrey Fashion Cares, Alexandre Plokhov, Bottega Veneta. Represented by agencies New York Ford Models, Hamburg SPIN Model Management, Paris New Madison, Elite Milan, London Established Models. I must say I have been very lucky. I can really be lucky that I got this chance with the modeling. I have traveled a lot, have traveled a lot, have met many people, have been at incredible places. I am in this industry for 8 years now so I know a lot of people and its nice to work with people you worked with before and to see them again. I have some friends from the industry, that is always important to know somebody around the world so you are never too alone when you are away from home. I can well imagine that it is a male model sometime too old. But you always say men are like wines that mature with age and are getting better.